* 617 yards. And a defiant postscript to a season of utter offensive dominance. 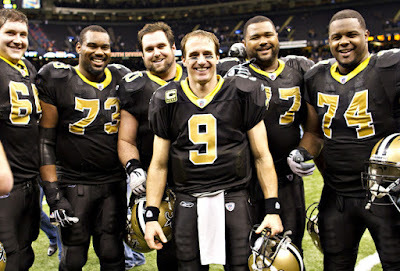 In a game where resting starters and playing second-stringers was a viable option, Coach Payton made good on his promise that the team would finish strong. In winning its first week 17 game under Payton, the Saints set a franchise record for most yards in a game (617), averaged an obscene 8.5 yards per play and obliterated the NFL's single-season yardage record. Racking up an ungodly 7474 yards this season, the Saints' offense vaulted past the 2000 Rams who previously held the mark with 7075 yards. That equates to averaging 467 yards per game, with these gems mixed in: 617 vs the Panthers; 577 vs the Giants; 573 vs the Vikings; and 557 vs the Colts. The unprecedented display of both offensive firepower and socialized distribution has produced a team with astonishing diversity: seven players with more than 30 receptions and 12 players with an offensive TD. In their last 8 games, all wins, the Saints outscored their opponents by an average of 35.9 to 18.8. That's an average margin of victory of 17.1 points. Further, since their week 11 bye, the Saints have outscored opponents 39.0 to 18.5 (20.5 margin). Finally, in their final three games, the Saints have eviscerated foes to the tune of 44.0 to 17.6 (margin 26.4). The trend? The Saints have continued to improve as the season has unfolded. Be afraid, NFL. Be very afraid. While some may view the week 8 loss to the Rams--and the resulting inability to secure a bye--as a potential deathblow for the Saints' postseason chances, I view it in another light. Maybe the shock and embarrassment of losing to two of the league's worst teams (Bucs, Rams) in the first eight weeks shook these Saints from the doldrums of apathy and incited in them a raging championship fire that shows no sign of extinguishing anytime soon. * How great is this offensive line? Since that week 8 nadir against St. Louis when Brees was pummeled to the tune of 6 sacks (and 9 hits) and the rushing attack produced just 56 yards, the offensive line has been the league's best in both pass protection and run blocking. On Sunday, the Saints logged their third 200-yard rushing day this season, with Chris Ivory registering the first 100-yard game by a Saints' RB this season (129). And Brees was neither hit nor sacked. The Saints' offensive line was impactful to the point of saving the team four first-half points. Jermon Bushrod ran down RJ Stanford after Stanford intercepted Brees and seemed destined to score a TD. Bushrod stayed with the play, shoved Stanford out of bounds, and the Panthers ended up kicking a FG on the possession. Little plays like that separate the great teams from the good ones. And on Sunday, the Saints reminded everyone, once again, that they are indeed a great team and maybe even the league's greatest. * The Saints' young defensive players made an affirmative statement on Sunday, with Patrick Robinson, Cam Jordan, and Martez Wilson all playing great games. Robinson has been up and down this season but when he plays well, he looks like an all pro. And his size and athleticism allow him to play both physically and dynamically. When the performance variance gives way to consistency, Robinson is going to be an excellent player. Cam Jordan played--to my eye--his best game of the season against the Panthers. He finally generated consistent pressure on the quarterback, and registered his first sack while having another one taken away due to an awful, Hochulian bungled horsecollar penalty. While Jordan has played well in run defense this year, his inability to rush the QB has been a concern. But on Sunday, he took a step forward in his development by playing with what seemed to be a high level of intensity and relentlessness. But of all the Saints' young defensive players, none is more promising than Martez Wilson. Against the Panthers, Wilson registered a sack, a QB hit and a tackle for loss. In sacking Cam Newton, Wilson unleashed all of his massive skills, blasting through the line, laying waste to the defenders in his path, and enveloping the QB in a dervish of speed and power. Wilson has been on the field increasingly more as the season has progressed and as he, presumably, has better mastered the playbook. When you combine the efforts of the three aforementioned players with other young, defensive players like Junior Galette, Ramon Humber, and Isa Abdul Quddus--not to mention Malcolm Jenkins and Tracy Porter--you have a young defense whose future is bright. * By all means, keep on doubling Jimmy Graham. Marques Colston can dismantle your defense just as effectively. Colston yet again played a spectacular game, making an impossibly difficult, contorted TD catch before then burning the Panthers for a back-breaking TD just seconds before the first half ended. In his last twelve games, Colston has been one of the league's very best WRs. During that timeframe, he's amassed 73 receptions for 1054 yards and 8 TDs. Within the framework of the Saints' everyman distribution model, those numbers are all the more impressive. * One of the more enjoyable aspects of these past 8 weeks is the difficulty I've had finding things to complain about. The one note of "bad," and one that's not particularly attributable to anything or anyone is the Saints missing out on a bye after going 13-3. I mean, that never happens. But it did this year, and the Saints will have to battle through it. We've seen repeatedly in the recent past teams go on the road and win their conference and then the Super Bowl (Giants '07, Steelers '08, Packers '10). There's no reason to think these Saints can't do the same thing. * Nothing of note, really. Besides Steve Smith's insanity. This dude needs help. We're talking about a guy who has been disciplined twice in his career for assaulting his own teammates. Like literally whipping their asses. On Sunday, Smith repeatedly and maniacally screamed at the Saints' sideline, and at least once in the face of Gregg Williams and once in the face of Sean Payton. Give it a rest already before you go all Rae Carruth on somebody.